This bowl of Ramen has hidden powers. Unique noodles and flavors you can only enjoy here. 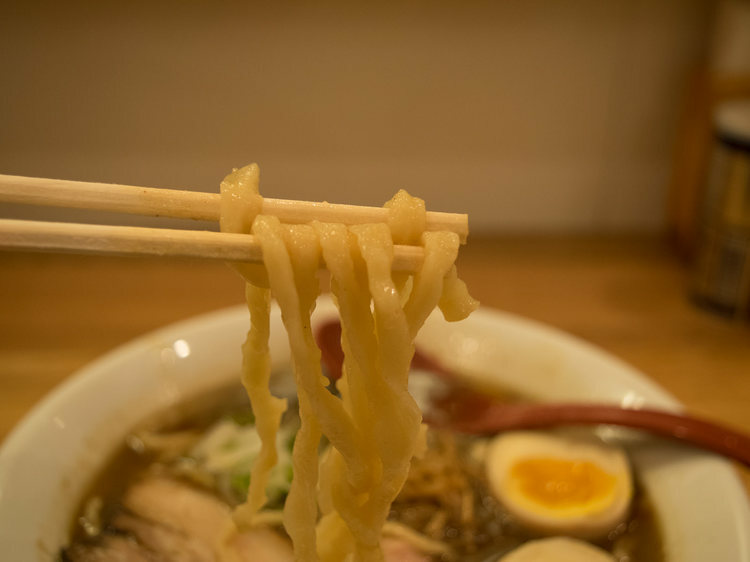 We think this is a bowl of Ramen you cannot miss, when you are in Tokyo. First, the noodles. Imagine this: they start making the noodles after you place your order. Have you ever had noodles that fresh? Upon receiving the order, the chef kneads the dough and start making the noodles. It is better than fiction. Previously, I have been involved in the creation of a Manga story about Ramen, and had this idea been proposed, I would probably have rejected it as being unrealistic. 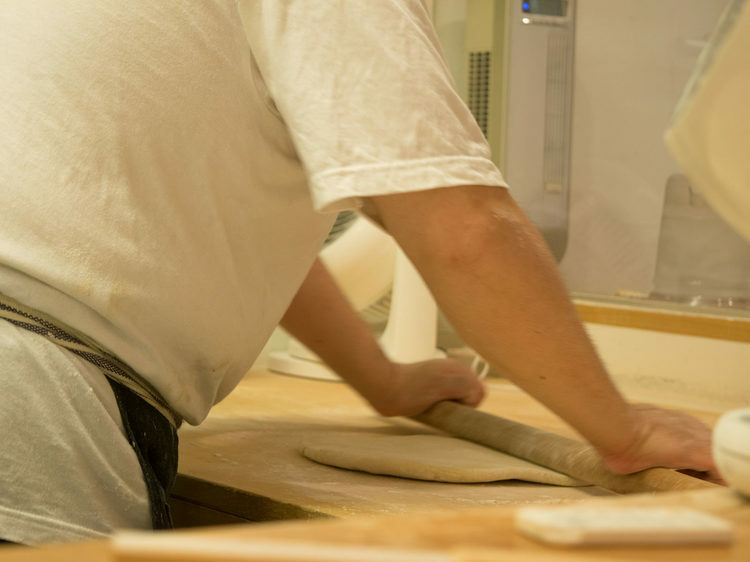 For each order, flour is mixed with water, kneaded, flattened with a rolling pin, folded, and cut. A beautiful series of movements that seems familiar, yet unique. It is amazing that this process is executed for each order. You will feel elated, even before tasting it. How about the taste? With the heightened expectations for the noodles freshly made right in front of my eyes, I must admit, it felt a bit off, when I took my first bite. Pure soy sauce and the rich fragrance of dried bonito. It was a predictable straight ball, maybe even too simple. But I was wrong. First, the noodles. The typical praises such as “smooth” and “chewy” were completely inapplicable to these noodles. They were deformed, and had an elastic texture like I had never experienced before. I was forced to keep chewing on these noodles with unfamiliar texture. The noodles featuring their original blend of domestic wheat offer a unique, smooth texture along with the sweetness of wheat. The secret to their noodle-making is not doing these 3 things: kneading, pulling, and resting.” After getting to know wheat producers, they came up with this cooking method to maximize the inherent flavors of wheat. These wavy, irregular noodles offer unique flavors. The soup, which consists of a soy sauce base, extravagantly features an unheated, unfiltered Ginjo soy sauce by “Yugeta Shoyu,” a famous distillery in Saitama prefecture, and has deep flavors that resonate with the DNA of Japanese people. The chefs were continuously making noodles during the course of our meal. They probably do this until the restaurant closes for the day. Their attitude and commitment toward food, especially in selecting this extremely physically-demanding method, and the simple flavors are priceless.